Posted January 16, 2018 · Overlapping Build Zones? 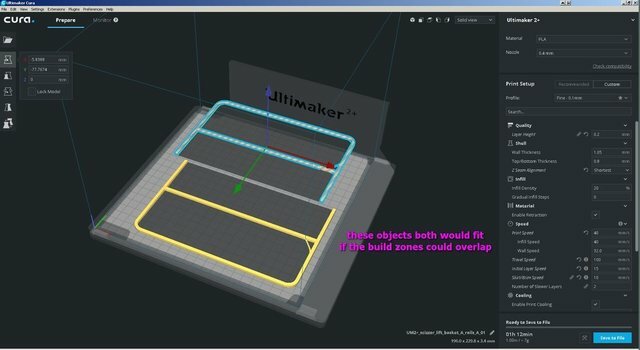 I have two objects that would fit on the build plate if their gray 'build zones' were allowed to overlap (and no, I don't want to rotate them to some other orientation... I want to print them flat like this). Is there any setting that would allow these objects legs to be tucked into each other so they could both be on the build plate like this? 1. Group them. Objects in a group don't have collision with each other. By using ctrl+click you can select (and move) a single object in a group. 2. Go to preferences -> general and uncheck the "Ensure models are kept apart" option. Note that this means that it's possible to have models that collide with each other. Be very careful as this can cause damage with your machine. Thanks very much for this info! The grouping and then re-positioning worked great.